Toilet paper was in mass production in China by the 14th century to the tune of 10 million packages per year with 1000 to 10,000 sheets per package. And the imperial court of Nanjing was one of the biggest consumers, along with the imperial family, who alone went through 15,000 sheets of soft fabric-like toilet paper, with each sheet delicately perfumed. So you could even argue that our ancestors had better TP than we do. Well-off families in other parts of the world resorted to wiping with wool, lace, or hemp. Those less well off resorted to more organic materials from grass and moss to seashells and corncobs... and the good old reliable hand, followed by good old soap and water. Even in modern times, in some countries it's not even possible to use paper, as there are not septic systems to support its use. Water is the preferred sanitary method of cleansing. The 16th-century French satirist Rabelais actually dismissed the use of dry paper as ineffectual for the job, preferring the downy neck of a goose. Modern toilet paper is said to have been invented by Joseph Gayetty, who in 1857 sold flat, watermarked, medicated sheets. Toilet paper rolls as we know them today came into vogue in the 19th century, and the patented (yes, patented!) cardboard tube appeared on the scene in 1893. A century later, wet wipes appeared as a moist alternative to dry toilet paper, but there has been much controversy surrounding their use, as they clog up septic and sewage systems and pollute our larger bodies of water and oceans, due to their inability to decompose. Environmentalists have a movement afoot to discourage flushing the plastic-based wet wipes, and even to refrain from their use at all. Toilet paper, on the other hand, is expressly designed to decompose in septic tanks, as opposed to other bathroom and facial tissues, and the notorious and nefarious wet wipes. Whether it's one-or six ply, colored or white, scented or not, all toilet paper today is basically the same premise: one big, long strip of perforated paper that is wound around a cardboard tube core. That isn't to say, however, that the traditional TP, as ecologically awesome as it is, can't, like everything else, be improved upon. 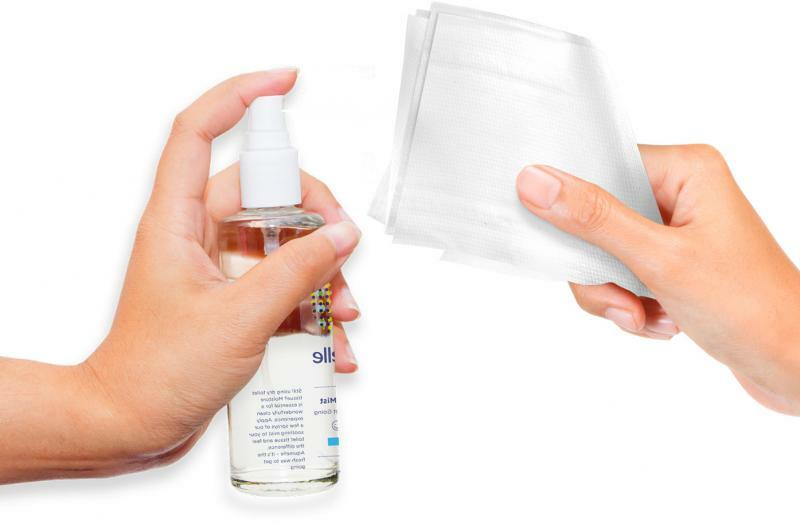 Enter the 21st century method of bathroom hygiene–misted toilet paper. Aquinelle Toilet Tissue Mist takes toilet paper into the new century by creating a truly flushable and decomposable wet wipe with a spritz that is both sanitary and pleasant as well as ecologically correct. Available in six sweet and refreshing scents in two sizes, one for home and one for travel. Because dry TP is so 20th century!